Bethany Hamilton didn’t let the loss of her left arm after a shark attack at the age of 13 stop her from getting right back on her surfboard. And today, the 27-year-old professional surfer has found herself in the throes of a new adventure: parenthood. Hamilton and husband (and fellow Amazing Race finalist) Adam Dirks recently announced they are expecting their second child early next year; son Tobias turned 2 this summer. And it seems like nothing — not that shark attack, and certainly not pregnancy — can slow this ESPY-winning athlete and motivational speaker down. Hamilton’s story of survival and perseverance inspired both the 2011 feature film Soul Surfer and an upcoming documentary, Unstoppable. And just like when she was pregnant with her first baby, Hamilton continues to ride the waves in her native Hawaii as she approaches the birth of her second. She’s also been teaching little Tobias how to handle a board. All that practice appears to be paying off. Last year, Hamilton achieved a career-best ranking at a World Surf League competition just months after giving birth. So, how does she do it? Here, Hamilton tells SheKnows about overcoming physical challenges, putting parenthood first and sticking to her unstoppable routine. SheKnows: You’re still surfing. Why is it so important for you to keep up with your sport, even during pregnancy? 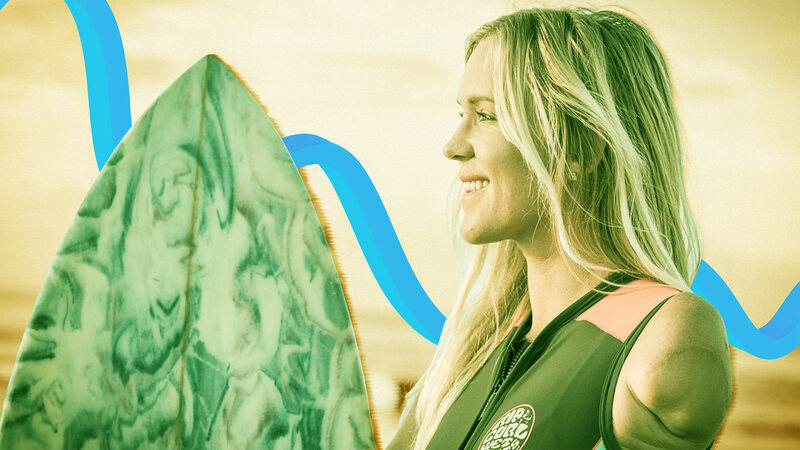 Bethany Hamilton: I’m planning to surf ‘til I’m about six months pregnant. I listen to my body and instinct, though too. The ocean and surfing is so healthy; it is uplifting, and that is always a good thing while pregnant. I also maintain my normal workout regime until about I’m four or five months along, and then I mellow things out. Later in pregnancy, I’ve enjoyed low-impact workouts, swimming, biking and lots of stretching for body alignment. It’s important to me to stay healthy — for me and the baby. Plus, it’s just who I am. I stay motivated, as well, because I want to bounce back fast so I can get back to surfing strong. SK: What myths about being a mom with one arm would you like to dispel once and for all? BH: A lot of physical, one-arm fears I had before becoming a mom ended up being nonissues. I just had to be clever and determined! I really believe parenting is so much more verbal than physical — though I love snuggles with my little guy. SK: How do you plan to teach your children about overcoming adversity? BH: My husband and I have been talking about this, actually. We look forward to having many intentional and age-appropriate talks about life challenges, whether it be something we are going through as a family or others we know or hear about. I look forward to this part in parenting. With a 2-1/2-year-old, we are starting with short, simple conversations, and I love it. SK: What has becoming a mom taught you about yourself? BH: I love it even more than I knew I would. It has taught me to be more and more thankful for my own parents. They are awesome in so many ways. It has taught me how I care for others and that I really want to be my personal best as a wife and mom because every choice I make impacts my family. I’ve become a bit more responsible and better at my time management. SK: Moms face a lot of pressure to be these perfect superwomen who “do it all.” How do you deal with that? BH: I have noticed a trend [of saying,] “You can still do everything as a mom.” Part of me agrees, but a lot of me disagrees. Life with little ones is so, so short, and if we try to “do it all,” we will miss out on incredible, beautiful, life-growing times with our children — and we won’t get that back. I have carried on my professional career in surfing and speaking, but… I’m still a full-time mom. My hubby is a full-time dad too. I see in our son how secure he is and how he is developing amazingly… To me, other accomplishments cannot compare.